Kramnik will return soon with the release of his first full-length album, ‘Dark Matters’. Progressive techno is the spinal cord of ‘Dark Matters’, with each track a journey through an atmospheric soundscape. It’s an intensely cerebral work, possibly music for the true connoisseur. The album comes with a hefty remix package based around the album’s tracks, ‘Viclone’, ‘M1’ and ‘Mongolium’. ‘Mongolium’ is given the star treatment with remixes by Timo Maas and Nick Warren. Maas delivers a deep, dark track that represents some of his best work. Warren breaks the mould with a track that is the furthest away from Kramnik’s original techno sound, planting its feet firmly in the progressive house arena. Additional remixes are included from Hans Bouffmyhre and SQL for a grand total of four new tunes. A selection of EPs, tactfully distributed via Soundcloud and released on Kramnik’s own label, Kram Records, meant tracks ended up in the record bags of some big names. Luciano, Paco Osuna, Sasha, Oliver Deutschmann, M.A.N.D.Y., Matt Darey, Cevin Fisher, Misstress Barbara, Danny Tenaglia, Paul van Dyk, Magda, Richie Hawtin, Sander Kleinenberg, Stephan Bodzin and others have all shown support for Kramnik over the past twelve months. 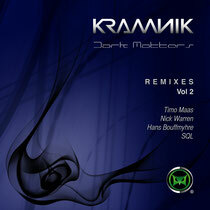 ‘Dark Matters Remixes Volume 2’ is released October 20 on Kram Records.